Indian astronomers have recently conducted spectrographic observations of long-period Comet Lovejoy to study its gas emission. They found that this comet showcases an asymmetric behavior at perihelion and an increase in the activity during the post-perihelion phase. The findings were detailed in a paper published July 22 on the arXiv pre-print server. Comet Lovejoy, formally designated C/2014 Q2, is an Oort cloud comet, discovered by Terry Lovejoy in August 2014. Its perihelion was on January 30, 2015 at a heliocentric distance of 1.29 AU, offering astronomers an excellent opportunity to observe its activity—in particular, the emission of numerous organic molecules in gas. The scientists, led by Kumar Venkataramani of the Physical Research Laboratory in Ahmedabad, India, utilized the LISA spectrograph to obtain spectra of the comet. LISA is a low-resolution, high luminosity spectrograph, designed for the spectroscopic study of faint and extended objects. The instrument is installed on the 0.5 m telescope at the Mount Abu Infra-Red Observatory (MIRO), Mount Abu, India. 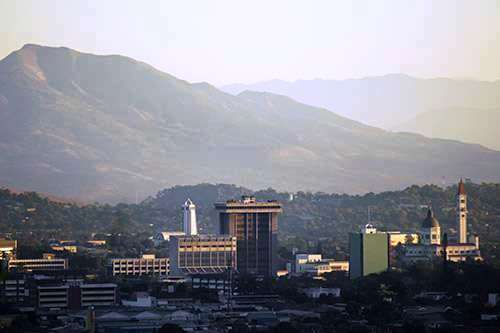 The observation campaign lasted from January to May 2015. It covered the period during which the comet’s heliocentric distance varied from 1.29 AU, just prior to perihelion, to around 2.05 AU post perihelion. The spectra obtained by the researchers show strong molecular emission bands of diatomic carbon, tricarbon, cyanide, amidogen, hydridocarbon and neutral oxygen. “Various molecular emission lines like C2, C3, CN, NH2, CH, O were clearly seen in the comet spectrum throughout this range. The most prominent of them being the C2 molecule, which was quite dominant throughout the time that we have followed the comet. Apart from the C2 emission band, those of CN and C3 were also quite prominent,” the scientist wrote in the paper. 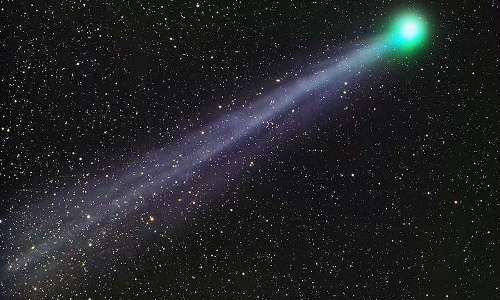 When a cold icy body like the Comet Lovejoy passes by the sun near perihelion, its ices start sublimating, releasing a mixture of gas and dust, which form the coma. Studying these emissions is crucial for scientists as comets could hold the key to our understanding of the solar system’s evolution and the origin of life in the universe. Therefore, the abundance of volatile material in comets is the target of many scientific studies that seek to reveal the secrets of planet formation and demonstrate the conditions that occurred when our solar system was born. According to the study, the gas production rate increased after perihelion and exhibited a decreasing trend only after February 2015. The researchers also noted a simultaneous increase in gas and dust, indicating an increase in the overall activity of the comet after its perihelion passage. “This kind of asymmetry has been seen in many comets. (…) Although we do not have data points at exactly the same distance for pre- and post-perihelion passages, we can, perhaps, say that this comet may have a large positive asymmetry,” the paper reads. The scientists concluded that this asymmetry suggests that there might be volatile material present beneath the surface of the comet. It is also possible that the surface of the comet’s nucleus consists of layers of ice that have different vaporization rates. However, as the team noted, more exhaustive study is required to confirm their conclusions. OVIRS will work in tandem with another OSIRIS-REx instrument—the Thermal Emission Spectrometer, or OTES. While OVIRS maps the asteroid in the visible and near infrared, OTES picks up in the thermal infrared. 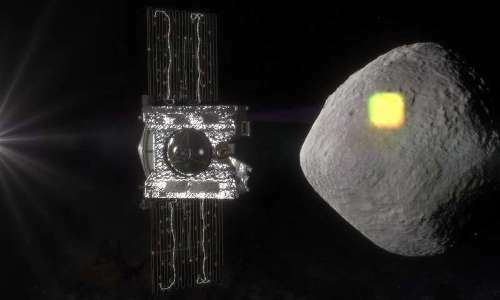 This allows the science team to map the entire asteroid over a range of wavelengths that are most interesting to scientists searching for organics and water, and help them to select the best site for retrieving a sample. Water is the key to life on Earth. Scientists continue to unravel the mystery of life on Mars by investigating evidence of water in the planet’s soil. Previous observations of soil observed along crater slopes on Mars showed a significant amount of perchlorate salts, which tend to be associated with brines with a moderate pH level. However, researchers have stepped back to look at the bigger picture through data collected from the 2001: Mars Odyssey, named in reference to the science fiction novel by Arthur C. Clarke, “2001: A Space Odyssey,” and found a different chemical on Mars may be key. The researchers found that the bulk soil on Mars, across regional scales the size of the U.S. or larger, likely contains iron sulfates bearing chemically bound water, which typically result in acidic brines. This new observation suggests that iron sulfates may play a major role in hydrating martian soil. This finding was made from data collected by the 2001: Mars Odyssey Gamma Ray Spectrometer, or GRS, which is sensitive enough to detect the composition of Mars soil up to one-half meter deep. This is generally deeper than other missions either on the ground or in orbit, and it informs the nature of bulk soil on Mars. This research was published recently in the Journal of Geophysical Research: Planets. “This is exciting because it’s contributing to the story of water on Mars, which we’ve used as a path for our search for life on Mars,” said Nicole Button, LSU Department of Geology and Geophysics doctoral candidate and co-author in this study. 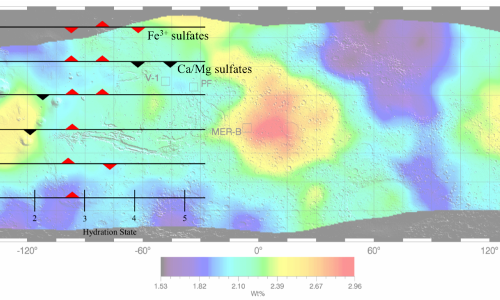 The authors expanded on previous work, which explored the chemical association of water with sulfur on Mars globally. They also characterized how, based on the association between hydrogen and sulfur, the soil hydration changes at finer regional scales. The study revealed that the older ancient southern hemisphere is more likely to contain chemically bound water while the sulfates and any chemically bound water are unlikely to be associated in the northerly regions of Mars. The signature of strong association is strengthened in the southern hemisphere relative to previous work, even though sulfates become less hydrated heading southwards. In addition, the water concentration may affect the degree of sulfate hydration more than the sulfur concentration. Limited water availability in soil-atmosphere exchange and in any fluid movement from deeper soil layers could explain how salt hydration is water-limited on Mars. Differences in soil thickness, depth to any ground ice table, atmospheric circulation and sunshine may contribute to hemispheric differences in the progression of hydration along latitudes. The researchers considered several existing hypotheses in the context of their overall observations, which suggest a meaningful presence of iron-sulfate rich soils, which are wet compared to Mars’ typically desiccated soil. This type of wet soil was uncovered serendipitously by the Spirit Rover while dragging a broken wheel across the soil in the Paso Robles area of Columbia Hills at Gusev Crater. Key hypotheses of the origin of this soil include hydrothermal activity generating sulfate-rich, hydrated deposits on early Mars similar to what is found along the flanks of active Hawaiian volcanoes on Earth. Alternatively, efflorescence, which creates the odd salt deposits on basement walls on Earth, may have contributed trace amounts of iron-sulfates over geologic time. A third key hypothesis involves acidic aerosols released at volcanic sites, such as acid fog, dispersed throughout the atmosphere, and interacting subsequently with the finer components of soil as a source of widespread hydrated iron-sulfate salts. Among these hypotheses, the researchers identify acid fog and hydrothermal processes as more consistent with their observations than efflorescence, even though the sensitivity of GRS to elements, but not minerals, prevents a decisive inference. Hydrothermal sites, in particular, are increasingly recognized as important places where the exchange between the surface and deep parts of Earth’s biosphere are possible. This hypothesis is significant to the question of martian habitability. Astronomers at the University of Michigan’s College of Literature, Science, and the Arts (LSA) discovered for the first time that the hot gas in the halo of the Milky Way galaxy is spinning in the same direction and at comparable speed as the galaxy’s disk, which contains our stars, planets, gas, and dust. This new knowledge sheds light on how individual atoms have assembled into stars, planets, and galaxies like our own, and what the future holds for these galaxies. The new NASA-funded research using the archival data obtained by XMM-Newton, a European Space Agency telescope, was recently published in the Astrophysical Journal. The study focuses on our galaxy’s hot gaseous halo, which is several times larger than the Milky Way disk and composed of ionized plasma. Because motion produces a shift in the wavelength of light, the U-M researchers measured such shifts around the sky using lines of very hot oxygen. What they found was groundbreaking: The line shifts measured by the researchers show that the galaxy’s halo spins in the same direction as the disk of the Milky Way and at a similar speed—about 400,000 mph for the halo versus 540,000 mph for the disk. Scientists have long puzzled over why almost all galaxies, including the Milky Way, seem to lack most of the matter that they otherwise would expect to find. Astronomers believe that about 80% of the matter in the universe is the mysterious “dark matter” that, so far, can only be detected by its gravitational pull. But even most of the remaining 20% of “normal” matter is missing from galaxy disks. More recently, some of the “missing” matter has been discovered in the halo. The U-M researchers say that learning about the direction and speed of the spinning halo can help us learn both how the material got there in the first place, and the rate at which we expect the matter to settle into the galaxy. “Now that we know about the rotation, theorists will begin to use this to learn how our Milky Way galaxy formed – and its eventual destiny,” says Joel Bregman, a U-M LSA professor of astronomy. “We can use this discovery to learn so much more – the rotation of this hot halo will be a big topic of future X-ray spectrographs,” Bregman says. A team of Brazilian astronomers, led by Denilso Camargo of the Federal University of Rio Grande do Sul in Porto Alegre, has discovered seven new embedded clusters located unusually far away from the Milky Way’s disc. The findings, presented in a paper published July 3 on arXiv.org, could provide new insights on star cluster formation. Embedded clusters are stellar clusters encased in an interstellar dust or gas, consisting of extremely young stars. They are crucial for astronomers to better understand star formation and early stellar evolution. Studying these clusters could reveal the origin of stellar masses as well as the origin and evolution of protoplanetary disks, where planet formation processes take place. In the Milky Way galaxy, most of embedded clusters lie within the thin disc less than 1,000 light years from the galactic midplane, especially in the spiral arms. 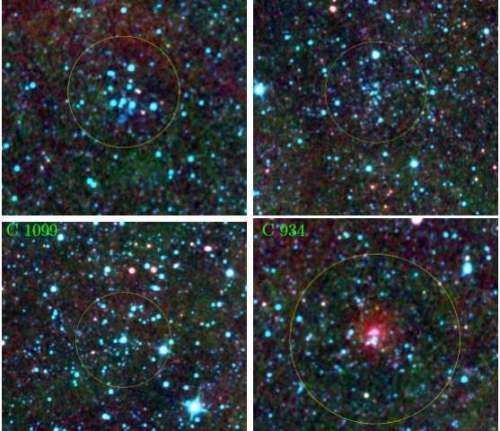 However, Camargo and his team detected two young stellar clusters earlier this year, and now, after spotting seven more, suggest that they could be more common on the outskirts of the galaxy than previously thought. “Now, we discovered seven star clusters far away from the Milky Way disc. Thus, this work points to a new paradigm in the star and star cluster formation, in the sense that the formation of such objects occurs in the halo and it seems to be frequent,” Camargo told Phys.org. The scientists found the new clusters by analyzing the data provided by NASA’s Wide-field Infrared Survey Explorer (WISE). This space telescope is monitoring the entire galaxy in infrared light, snapping pictures of mainly remote galaxies, stars and asteroids. WISE was chosen for this job as it captures embedded clusters that are invisible at optical wavelengths, due to the fact that they are engulfed in significant amounts of interstellar dust. 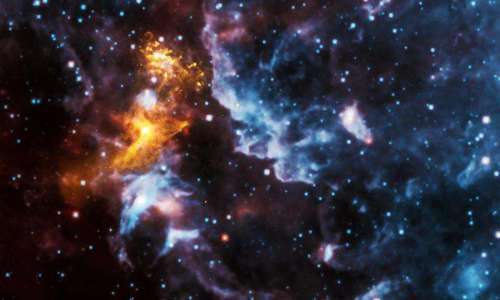 “WISE provided infrared images of the entire sky, allowing us to penetrate the gas and dust within giant molecular clouds, in which the star formation can take place. Recently, we discovered more than 1,000 embedded clusters using WISE,” Camargo said. According to the research paper, three newly found objects, designated C 932, C 934, and C 939, are high-latitude embedded clusters, projected within the newly identiﬁed cloud complex. These clusters are located at a vertical distance of about 16,300 light years below the galactic disc. Other new clusters, named C 1074, C 1099, C 1100, and C 1101, are in the range from 5,500 to 10,400 light years above the disc. All these clusters are younger than five million years. The team noted that the new findings indicate that a sterile galactic halo could host ongoing star formation. The newly detected embedded clusters provide evidence of widespread star cluster forming processes far away from the Milky Way’s disc. 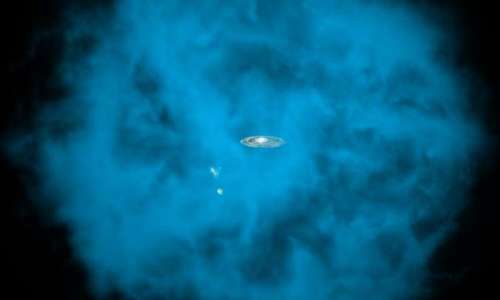 “The discovery of stellar clusters far away from the disc suggests that the Galactic halo is more actively forming stars than previously thought. Moreover, since most young clusters do not survive for more than five million years, the halo may be raining stars into the disc. The halo harbors generations of stars formed in clusters like those hereby detected,” Camargo said. Before the team’s paper was published, it was thought that star formation processes in the Milky Way occur in the disk, but not in the halo. Thus, as Camargo concluded, this new study represents a paradigm shift, in the sense that a sterile halo becomes now a host of ongoing star formation. Recently, astronomers used data from NASA’s Spitzer Space Telescope—a powerful space observatory launched in 2003 that observes the Universe in infrared light—to look at a molecular cloud called L183, which is about 360 light-years away in the constellation Serpens Cauda (the serpent). Their goal was to see how light scattering affects the view of the cloud at the mid-infrared wavelength of 8 microns (μm). Ultimately, the astronomers hope to use this data to get a better look inside the clouds. 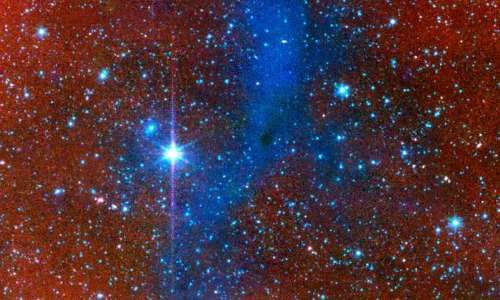 In so doing, astronomers hope to gain a better understanding about how young stars form. 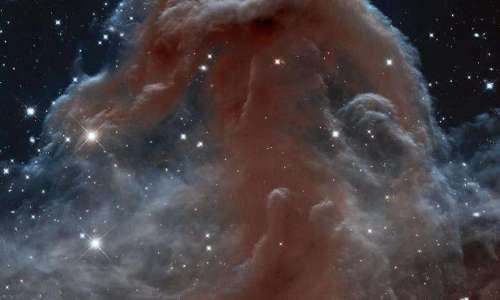 Other, unrelated studies of dust clouds are also looking at where elements—including those grouped in molecules associated with life, such as water—are situated in young solar systems. Lefèvre was able to use the 8-micron scattering model correctly to fit other observations of the cloud. However, if she tried to observe using other wavelengths—such as 100 microns or 200 microns—she saw a very different picture concerning dust absorption. It’s possible that some of the measurements were affected by ice on the dust, which was not accounted for by her radiative transfer model, Pagani said.